Follow these directions to enter to win the SECOND and THIRD $100 GIVEAWAYS of Teachers Pay Teachers Gift Certificates. FIRST $100 TpT Gift Certificate! 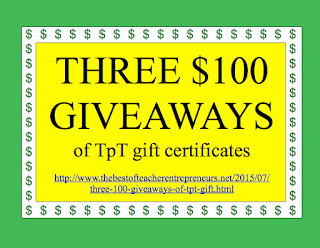 All new members and members who have renewed their membership in The Best of Teacher Entrepreneurs Marketing Cooperative from June 2, 2015 – August 8, 2015 at 11:00 P.M. Pacific Time will be entered to win the SECOND $100 TpT Gift Certificate. TIME IS OF THE ESSENCE! The time and date you become a TBOTEMC member determines if you will be posting on The Best of Teacher Entrepreneurs, The Best of Teacher Entrepreneurs II, The Best of Teacher Entrepreneurs III, etc. THE LINKS OF ALL OF THE POSTS FROM THE VARIOUS BLOGS WILL BE ADVERTISED AGAIN IN ALL OF THE TBOTE BLOGS…so your TpT products will still be advertised on our premier blog, The Best of Teacher Entrepreneurs, which is currently ranked #34 in the May 2015 Top Referral URLs which brings in traffic to TpT. 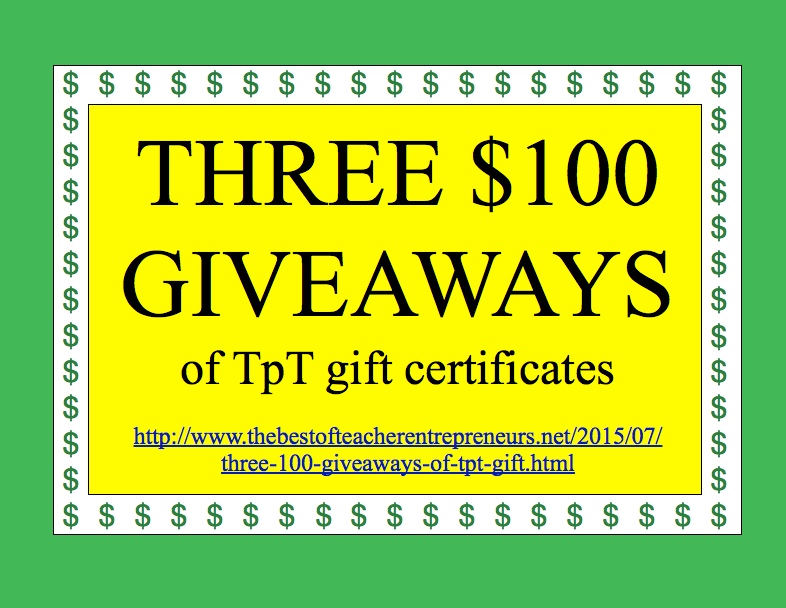 All members of The Best of Teacher Entrepreneurs Marketing Cooperative will automatically be entered to win the THIRD $100 TpT Gift Certificate on August 8, 2015. The three winners will be announced at our blog, The Best of Teacher Entrepreneurs – http://www.thebestofteacherentrepreneurs.net.